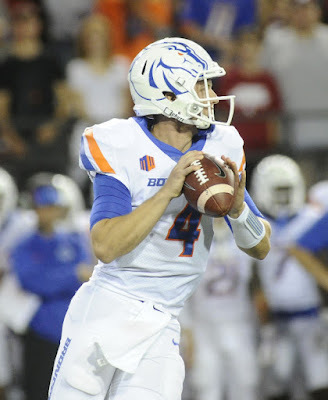 Offense: Senior quarterback Brett Rypien flirted with the idea of the NFL before deciding it was in his best interest to finish up his career with the Broncos. Rypien took over as starting QB halfway through his true freshman season and has put together an illustrious career in Boise. With 9,876 career passing yards, he is the active leader in career yards in FBS football, and knows how to win at this level. It may be a slight stretch to consider Rypien a Heisman candidate, but the veteran is a proven winner and has All-MWC talent without a doubt. Rypien will be supported by a quality running back in junior Alexander Mattison, who did a superb job replacing the departed Jeremy McNichols in 2017. Mattison quietly ran for 1,086 yards and 12 scores, proving to be quite the big play threat whenever he touched the ball. Sophomore Robert Mahone will be used as the change of pace option after Ryan Wolpin graduated. Mahone doesn't have Mattison's speed or explosiveness, but has proven he can move the chains. The only major concern for an offense that has a ton returning from a unit that averaged 32.5 PPG last season is the receiver corps. Rypien will sorely miss top wide out Cedrick Wilson, who had a school-record 1,511 receiving yards in '17, as well as tight end Jake Roh (nine touchdown receptions). Head coach Bryan Harsin and OC Zak Hill are extremely hopeful a pair of seniors, A.J. Richardson and Sean Modster, can step up and fill the void. Both have proven they can produce, as Richardson had 33 catches for 494 yards, and Modster 32 for 335. However, going from a supporting character to the main guy is obviously a tough transition, and the the aerial attack will have to smooth some things out as the season pushes on. Big expectations are also being reserved for sophomore Octavius Evans, who had a great spring, and newcomer Khalil Shakir, considered the gem of this year's recruiting class. Boise State has had nine straight seasons with a 1,000-yard rusher and while that can be attributed to a good collection of backs over this time period, a lot of credit has to be given to the O-Line as well. This particular unit might not end up being the best in Broncos' history or anything like that, but three starters return, giving a healthy dose of experience. Sophomore left tackle Ezra Cleveland started all 14 games last year, and is the most likely to compete for any awards or honors. Amazingly, Boise's 32.5 PPG was the lowest the program has had since 2012, even though it was second best in the Mountain West and 36th in the entire country. The good news is that this group has the talent to really improve, despite the relative questions on the outside. The return of Rypien and Mattison give Harsin and the Broncos two proven contributors and one of the most underrated backfields nationally. Expect plenty of fireworks from this particular unit, which it will need in the wide-open Mountain West. Defense: While the offense was very good in 2017, the main reason for Boise's 11-3 campaign was actually the defense, which was downright dominant at times. There is reason to be excited about the D once again this year, with the only big name gone being linebacker Leighton Vander Esch, a first-round NFL Draft selection. The defensive line is devoid of any huge names, but has nearly everybody back and is very deep. Seniors Durant Miles and David Moa are proven veterans, and overall, the three likely starters on this line have 56 career starts. "Stud" defensive end Curtis Weaver was used as a specialist in his freshman year, and exploded onto the scene, leading the team with 11 sacks. It will be interesting to see whether a full-time starting role improves those numbers or actually ends up making him less effective because blockers will to see him more and learn his tricks. Either way, Weaver should find a way to make an impact as a standup end/linebacker hybrid. Vander Esch's absence will definitely be felt heavily in the middle at linebacker, as he played a crucial role in the nation's 17th rated rush defense and had 141 tackles. It will take some time for Boise to find a clear replacement for the star linebacker, but junior Tyson Maeva should ensure there isn't too much slippage in the linebacker corps, as he had 84 tackles a season ago. Versatile redshirt freshman Ezekiel Noa made some noise in the spring, and could be a breakout candidate. While the front seven should still be very good, the real strength of this defense will be the secondary. All four starters are returning, and sophomore nickelback Kekaula Kaniho proved to be quite the playmaker as a reserve last year, with a pick-six and fumble recovery for a score. The cornerback spot is manned by All-MWC Tyler Horton (3 INT's in '17) and physical sophomore Avery Williams. Safety is also incredibly strong and deep, as junior Kekoa Nawahine is the team's top returning tackler (108) and DeAndre Pierce is as rangy as they come. Boise allowed just over 212 yards passing per game last season, which wasn't great nor terrible. I firmly expect this experienced group to greatly improve those numbers, and possibly have one of the premier defensive backfields in the nation. Boise has never really been known as a school that prides itself on defense, but this defense is stocked to the brim with returning talent and veteran contributors. Unless the injury bug hits hard, it is hard to imagine this group not being a Top 15 unit nationally. Special Teams: Senior Haden Hoggarth is just another returning Bronco with experience, as the placekicker hit 18 for 23 on field goals in 2017 and was flawless on extra points. Two proven punters are also back in town, as Quinn Skillin and Joel Velasquez split time a season ago and both played admirably. Cedrick Wilson is a loss in the return game, but there are weapons surely ready to step up. For a long time, Boise State has had a serious advantage in talent over most Group of Five schools, but now they have an even stronger leg-up: experience. 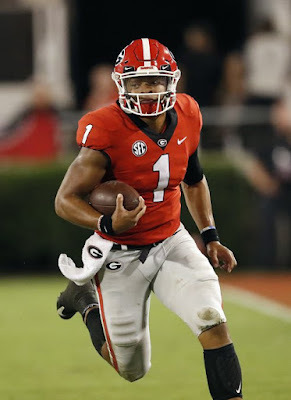 They have a four-year starter returning at the sport's most important position, a proven feature back and a defense that has experience nearly everywhere. With that in mind, it is hard not to like the Broncos as the overwhelming favorite in the Mountain West, especially considering they went 7-1 against the conference a season ago and won the conference title. 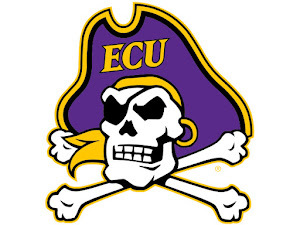 The bigger question is whether this team can compete for a New Year's Six Bowl as the Group of Five representative. With all that experience returning and UCF surely going to take a step back, I like Boise making their first NY6 bowl since 2014, when they beat Arizona in the Fiesta Bowl. If they do get there, we all know the magic the Broncos have been able to come up with on the sport's biggest stages.